Consisting of the 5 lumbar vertebrae with intervertebral discs, sacrum with flap, coccyx, spinal nerves and dura mater of spinal cord. On flexible stand. Prolapsed Lumbar Section Model Set of 5 BONElike™ Lumbar Vertebrae Spine Model Set 5 Vertebrae - Atlas, axis, cervical, thoracic and lumbar vertebrae. Loosely threaded on nylon. We use the lumbar model for all of our patients to explain what a bulging disc is and what it looks like etc. Love them from your company. Very detailed and accurate and awesome stability. 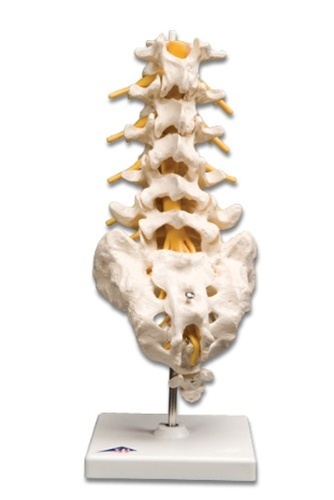 This lumbar spine model was used for courtroom demonstrations. It was easy to work with and easy to modify to show specific anatomical features associated with surgical procedures. It is an excellent value for the price.